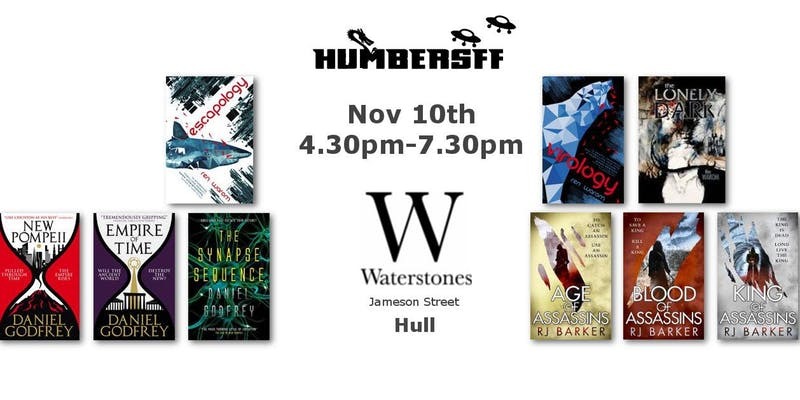 Sat 10 November 2018, 16:30 – 19:30, Waterstones Hull. Our very first guest returns – we must be doing something right. Since his last visit, his time travel novel New Pompeii was nominated for a British Fantasy Award, and he’s had two further books published. AI and algorithms are responsible for keeping crime incheck in his latest novel. Frighteningly close to being fact not fiction, we think Synapse Sequence, his third novel with Titan Books may be his best yet. Crime meets Science Fiction and Thriller – there’s a reason why the critics are comparing him with Michael Crichton. We’re really excited to be able to bring Ren Warom to Hull. Her work can be found on Tor.com as well as the novels and numerous short stories she has set loose in the world. We understand that there is more to come from her vivid and captivating writings in 2019 as well. Ren Warom’s science fiction is supported by knowledgeable and informative blog on mental health. Having played in a rock band before deciding he was a rubbish musician, RJ returned to his first love, fiction, to find he is rather better at that. Books in RJ Barker’s The Wounded Kingdom Series have been shortlisted for the Gemmell Awards, The Clarke Awards, The British Fantasy Awards to name a few. Featuring Girton, a club-footed assassin, we think you’ll agree the series is a fun and entertaining read. As always there will be books to win in our raffle, and a chance to ask questions of our fearless authors. Places are free, but space is limited. Don’t miss this!